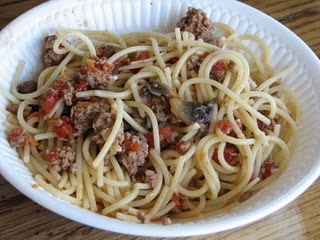 This is a recipe for a quick and easy pasta dish. This takes 30 minutes or less to cook. It is a great recipe to use for dinner if you have had a busy day. I prefer to use recipes like this to using a jar of spagetti sauce. I do occasionally use the jarred sauce in some things but when a recipe is this easy and this tasty, I don’t see why I should serve a jar of sauce over noodles to my family. But that is just me. If you like the jarred sauces go ahead and serve them. I usually serve it with bread and a salad. This makes quite a bit. It will last us two meals, so if you are cooking for a small family you may want to half the recipe. Add tomatoes and their liquid. Stir in milk and thyme 1/2 teaspoon salt, and 1/8 teaspoon pepper. Simmer 20 minutes. Meanwhile, in a large pot of boiling salted water, cook fettuccine or spaghetti according to package instructions. Reserve about 1/2 cup of the cooking water; drain pasta and return to the warm pot. Add meat sauce, and toss. Add pasta water as needed if the sauce seems dry. To serve, sprinkle with Parmesan. -I had some mushrooms that needed to be used so I put some of those in also. This looks great, I think I’ll have to try it!